Note: Please allow 3 weeks for your ring to be made. 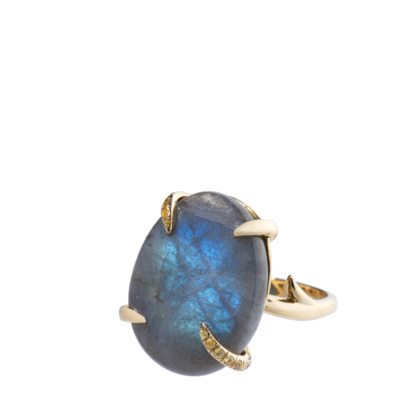 The exquisite tones & irridiscent blue flash of this carefully sourced and bespoke-cut labradorite inspired the name. The famous Hinatuan enchanted lagoon river has a beautiful, mysterious blue hue at the opening to an underground cave. It's said that the colour was made by fairies stirring the water with their wands, toying with sapphire & jade to achieve the unique shade. Stone length: 21mm. Width at the widest point: 17mm. Yellow sapphires claws contrast with the blue. Labradorite is considered by mystics to be a stone of transformation & magic, and is also widely used as a meditation tool.